When I first came to West Chester University, I was so proud and excited to be a Ram. The opportunities WCU offers to their students gave me the hope of a wonderful finish to my college career. WCU has been the third college I’ve attended, and I have never felt more welcome than I have on any other campus. Over the past three semesters, I’ve made wonderful friends, had an incredible education and attended awesome events. I get so excited to come back to campus, and that’s not a feeling I’ve experienced before. I love talking about West Chester University to my friends and family back home; telling them everything the university has done for its students and for me. This has become my home. But at what cost? I felt an obligation to be there. Not just for me, my friends and my fellow Rams — but for future students attending any state school. Pennsylvania college students graduate with an average of $35,759 dollars in student debt. I know from personal experience, as I have surpassed that amount of money and I am well on my way to a six-digit debt. This crushing debt is one of the many reasons I chose to jump on that bus to Harrisburg. The Pennsylvania Promise is something I stand by. The state used to pay 2/3 of a students college tuition and now it’s less than 1/3. 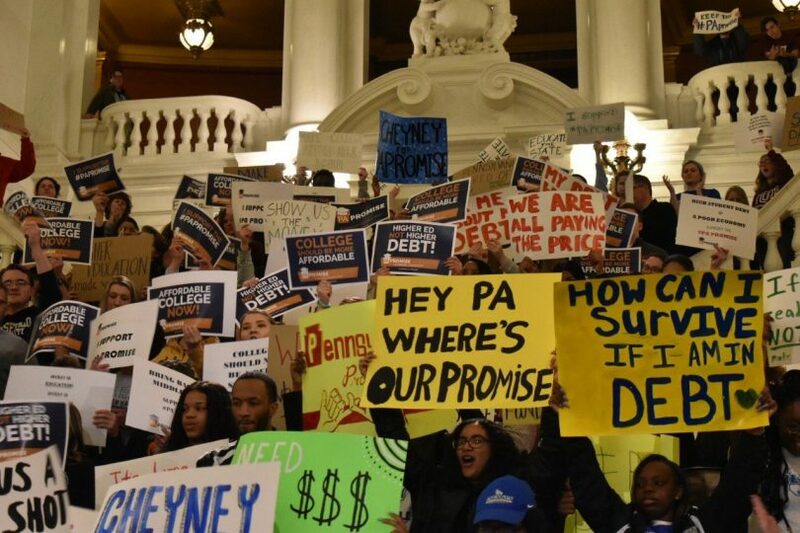 So, on Wednesday, March 27, West Chester University and our sister PASSHE school, Cheyney University, took two buses of students to Harrisburg to rally for affordable education. I felt an obligation to be there. Not just for me, my friends and my fellow Rams — but for future students attending any state school. From being in the Student Government Association, I learned that the idea of the PASSHE (Pennsylvania State for Higher Education) was for affordable college for all Pennsylvania Students. But this is not what is happening at the moment. Every student should be able to have access to higher education. At one point, primary education wasn’t accessible to all students. People rally and fought for change. Now let’s rally and fight for affordable higher education. During the rally, President of APSCUF (Association of Pennsylvania State College and University Faculty) Dr. Kenneth M. Mash said, “In its 2018 ‘Best States’ report, U.S. New and World Report ranked Pennsylvania 50 for higher education. No lawmaker or resident of Pennsylvania should be proud of this ranking. 50 in the U.S. News. 50 in average student loan debt. 49 in student loan debt per capita. 49 in higher education support per capita. It’s an embarrassment.” Indeed, President Mash, it is. Beyond thinking about where the Commonwealth stands within the nation, what about generations before us saying how they worked their way through college? President Mash had a response for that too. He said, “according to the Keystone Research Center, if one attended one of our state-owned universities in the 1970s, they could work 5.5 summers at a minimum-wage job to pay off four years’ tuition. Today, a student working a minimum-wage job would have to work 18.5 summers!” This needs to change. A speaker at the rally said, as college costs go up and debt goes up, it seems like the wages haven’t increased enough to support their loan payments. This is something that affects teachers across the Commonwealth as their education continues even after a bachelor’s degree and master’s degree. This is a reality for a lot of Pennsylvanian’s. P.A.’s Promise for higher affordable education was within reach for some students, but not for all. We need to educate the whole state not just the higher classes. Every student should be able to have access to higher education. At one point, primary education wasn’t accessible to all students. People rally and fought for change. Now let’s rally and fight for affordable higher education. We need to stand united together and call our House Representatives and Senators and demand to make higher education affordable in the Commonwealth. Our representatives should support SB111 and HB244. West Chester’s State Senator is Andrew E. Dinniman – (610) 692 2112 and West Chester University’s PA State House Representative Carolyn T. Comitta – (717) 705-2075.